THE ZUMA administration is the subject of a number of public embarrassments. All involve, maladministration, graft and the failure to abide by the rule of law. The latest comes with the release of a report into the 2012 Marikana massacre which led to the deaths of approximately 44 people, and more than 70 persons being injured. The Farlam Commission appointed by president Zuma, predictably, whitewashes the administration’s involvement in the events which lead up to the massacre. Deputy-President, Cyril Ramaphosa, who was non-executive director of Lonmin, a significant shareholder in the company (through its shareholding structures), and a senior member of the ANC at the time, has been given a clean bill of health, so too the political structure and chain of command which lead directly to the massacre. The release of the report comes days after scandals involving the failure to arrest Sudan’s Omar al-Bashir wanted by the International Criminal Court and international community for the Darfur Genocide, and just weeks after a FIFA bribery scandal involving Danny Jordaan and under-the-counter payments made in exchange for votes. Only a month earlier, Police Minister Nathi Nhleko was telling the public that additions to the Zuma compound at Nkandla such as a swimming pool and amphitheatre, were all vital “security features”, for which the president “is therefore not liable to pay”. The embarrassments are leading ordinary South Africans to ask whether it is perhaps time for Zuma to go? South Africa under Msholozi, the clan name under which Zuma is also known, has seen a bloated cabinet, one of the biggest in the world, with a concomitant increase in departmental complexity, government red-tape and an out of control civil service, as the modus operandi of the country has moved from industrial output, to the aegis of big government, a nation which produces politicians instead of productivity. Anyone following the debate over Eskom’s tariff increases, could be forgiven for thinking that South Africans exist to fund the energy parastatal and its emphasis on Soviet-style gigantism — two large fossil fuel projects and a failed R10 billion Pebble-bed Modular Reactor programme, and now the threat of a BRICS-lead trillion rand nuclear build, for which the country undoubtedly, has insufficient foreign reserves to foot the bill, when and if it arrives. Eskom, despite having a monopoly mandate, increasingly finds itself unable to provide electricity. The simple logic of the market has proven to be an Achilles heel. The increase in the civil service has not countered the loss of jobs in the private sector. 20 years after the constituent assembly drafted the Constitution and Bill of Rights, ushering in a universal franchise and human rights, the country is paying lip-service to its contents, institutions such as the public protector are ignored. Likewise, the judiciary. Under Zuma, a narrow ethnic nationalism has found itself at odds with the secular values established under previous governments. The president has cemented power, rolling out salary increases for “headmen” (what no women?) under a new dispensation which favours tribal authority at the expense of citizenship and the rights of the individual. Thus the road to serfdom, instead of the great society of Nelson Mandela. The judgement took just five minutes. 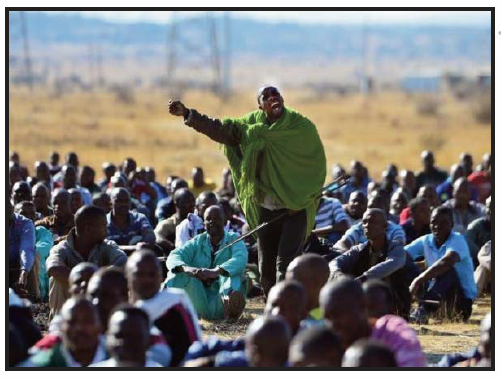 The Constitutional Court dismissed a request by 270 injured and arrested mineworkers from Marikana’s Lonmin mine for leave to appeal for funding from the state for their legal representation at the Farlam Commission of Inquiry. The mineworkers were not even given an opportunity to state their case. Instead the court chose to duck the issue and based its judgment on a technicality. The Constitutional Court, the highest court in the land, ruled that it was not competent to deal with a matter being handled by a lower court. This was a lost opportunity for the Constitutional Court to level the playing field and to affirm the new human rights culture that this society is committed to building after the brutality of apartheid. It was also an insult to the workers who died, and all other victims of police brutality and state repression in the history of South Africa. The reality is, each day that the commission sits, these mineworkers face a David and Goliath battle against a state, a police force and Lonmin, all of whom possess formidable funds to employ an army of top lawyers and researchers. The spirit of callousness against the miners who were attacked by police on the 16th August doesn’t stop with the withholding of state funds to meet their legal representation. The North West ANC failed to attend the highly successful commemoration rally in Marikana last Friday (16th August). This was an opportunity to show their respect to the families of all those who had died and the injured and arrested survivors of the Marikana massacre. Their refusal to participate was shocking even to the national ANC, who condemned their action in a press statement the following day. The commemoration was planned as a day of unity and healing and a call to continue the fight for a living wage. Many political parties shared a platform to give messages of support to the miners and their families. The NUM was invited to share this platform. They also refused to attend, despite the fact that at the time of the massacre, many who lost their lives were in fact NUM members. A year on from the massacre, there has been no justice, no move by mining companies to address the issue of a living wage and now to add insult to injury, miners at Anglo Platinum mines face the company’s decision to go ahead with the retrenchment of around 7000 jobs. Many from Anglo Platinum, as did those from Implats, joined their comrades from Lonmin at the commemoration on the 16th August. 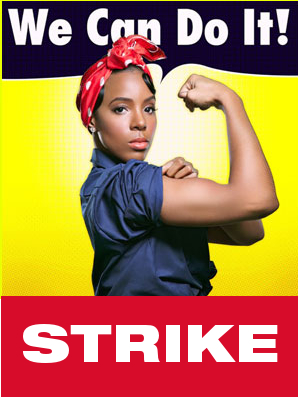 It is no wonder that workers across the platinum sector are beginning to speak in one voice in combining the demand for a living wage with those of justice against state brutality and in defence of jobs. The pursuit of legal and peaceful channels by the miners in their quest for justice for those who were arrested, injured and killed has been a futile exercise. The workers clearly cannot expect justice or truth from the courts of the land and even less from the Farlam Commission where the odds are stacked against them. The only option left open is to boycott the commission and to take collective protest action to demand that the government pay the legal fees of the miners’ representatives. 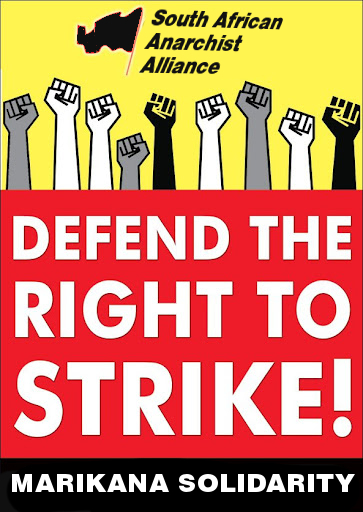 This demand should now be merged with the continued fight for a living wage and for defence of jobs at Anglo Platinum and taken up across the platinum belt. Marikana Commission linked to Apartheid Special Forces? No, this isn’t a joke. 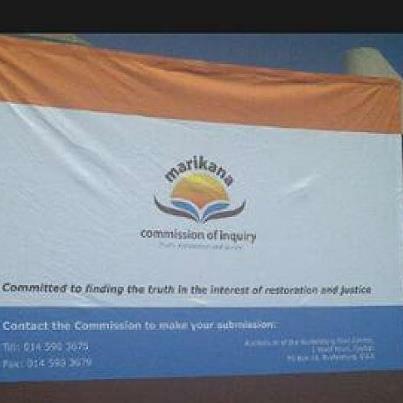 The Old South African flag appears to have made a come-back in the choice of colours used for the Marikana “Farlam” Commission. The logical consequence of allowing previous commissions of inquiry to simply rubber-stamp government policy? Does anybody remember the so-called Truth Commission? The lies are now self-evident.